Please help support the family of Captain Jeff Kuss. Captain Kuss made the ultimate sacrifice and has left behind his precious wife Christina and two small children Calvin 4 and Sloane 1. 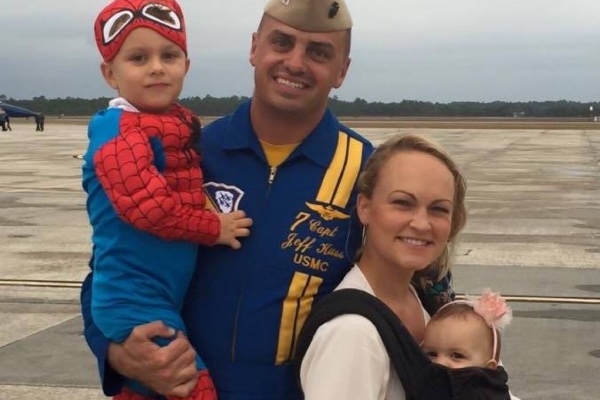 This family needs all of our support and Jeff is a true American hero who saved the lives of thousands in this terrible tragedy. Jeff was born and raised in Durango, Colorado and learned to fly before he could drive. Please show your support and honor this true American hero. Due to the overwhelming support and love shown for the Kuss family, we have received requests to raise the goal for Jeff's family support fund. Supporters all around the nation are able to express their condolences and help through their comments and support by contributing to Jeff's family support site. Nicole Ferrarese Perino, loving sister and aunt. On behalf of the Kuss and Ferrarese families. I have wracked my brain countless times over the last month and a half about what this gofundme means for the kids and I. There has been some scrutiny over whether or not we "deserve" it. I've wondered that myself. Jeff was our provider of safety, love, and passion to be greater than we were yesterday. We still feel him here with us, but there is a deep hole in our hearts. In questioning what this means to me, I come back to the number of people this gofundme shows are in the kids and my corner lifting us up in love and support. It is truly incredible! We have a nation of people who want us to thrive. In life I was able to tell Jeff that if the unthinkable was to ever happen to him, we would be okay. Thank you from the bottom of my heart for helping me believe that not only can we be okay, we can continue to strive to be greater than we were yesterday. You all mean more to me than I could possibly put into words. It is absolutely humbling to see so much love and kindness being poured out onto Christina, Calvin, and Sloane. Their incredible husband and Papa is irreplaceable, but what you are all doing to support and encourage them with your words, your donations, and prayers is truly breath taking. Our families have so many feelings of gratitude during this heartbreaking season of her life because of you. From the depths of our hearts, and with the upmost respect for each of you- Thank you so very much. 'I am absolutely beside myself and humbled at the amount of love and support I have received over the last 4 days. This morning I feel a shred of peace and though I know it wont stay, I attribute it to the amazing things all of you are doing for myself, my children and to honor Jeffery. I feel you all deeply and want to say thank you from the bottom of my heart. 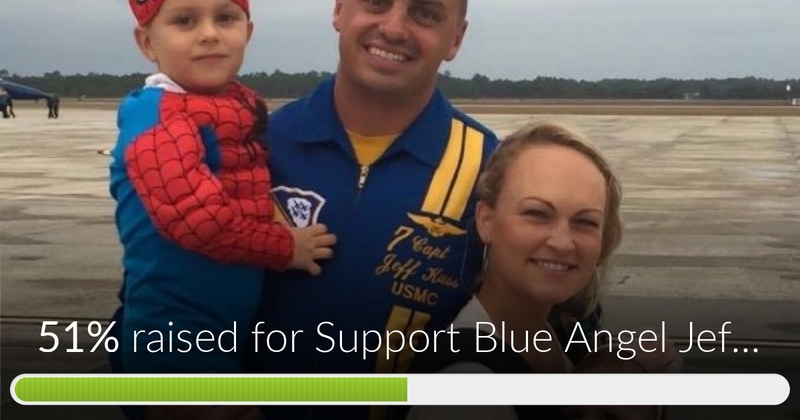 Support Blue Angel Jeff Kuss Family has reached 51% of its goal. Thank you to everyone who has donated! Please keep this energy going. Nicole & Christina are my cousins. Christina Kuss was the wife of Jeff Kuss... She went by Christina Ferrarese (our maiden name) to protect her family. They are setting this fun up to assure that the children are taken care of. They will get help from the military but it is very understandable and appropriate for family to want to store more funds for their future. If you do not feel that this is something you can support all you have to do is not donate. No need to add stress or put allegations on our family!!! Thank you to everyone who has sent prayers and support. She said it best.. One day at a time! For those asking how much money this family really needs considering the benefits that the military provides, let me give you some insight from a fighter pilot's kid. How many times in your life did your father or mother deploy to a foreign country, unable to tell you or their spouse exactly where they were, without instant modes of communication (text/emails come sparingly - we are at war)? For 12 months at a time? How many times was your family uprooted at the drop of a dime and moved halfway around the world for service to God and country? How many times did you wonder if every skirmish, every plane that was shot down, meant that a life lost was one that you touched physically? That dried your tears? That sang you lullabies? That was your own personal hero? That hero, who flew over the air station hangar, who brought pure joy to his children who couldn't wait to wrap their arms around him. And a loving spouse who stood by their Marine. My friends, there is no amount of money that can replace that hero. There is no price tag on a life. To Captain Kuss, thank you for your service to this country. Semper Fi. To the Kuss family, my love and prayers will be with you always. Let's be a little respectful and leave unnecessary comments to yourself. If you aren't going to make a donation, your opinion on the fundraiser is irrelevant. I live in Tennessee and he died a hero. There was a big apartment complex, a bowling alley and an elementary school. He could of ejected but would of crashed into one of the areas. Instead he managed to get to a open field area and crash. He died saving others. RIP to a true hero. Semper Fidelis Sir. I will share this tp our local tennessee pages. People have been looking where to help. Commenting to help confirm the legitimacy of this fundraiser. I know both Jeff & Christina and their extended family. The organizer is indeed Christina's sister. Unfortunately SGLI, like any other benefits, are limited, and while certainly helpful, can't completely cover the long-term financial loss when any primary income earner passes away. I live in Smyrna and feel great sorrow at the loss of Capt. Kuss. He probably saved my granddaughter's and my life. If he hadn't stayed with the plane my neighborhood was in its direct path. I will always be thankful for his selfless sacrifice to save lives. Jeff was a real hero in every sense of the word. May he watch over you with his new set of wings in heaven. God Bless you and your family. I saw the interview on CBS this morning today. The journalist that got to fly with him, said she asked him "when he would use the ejector handle?" He said "Only if he knew the people on the ground would be safe." I wish I could turn back time and change today. It started out so happy and full of excitement for this weekend's air show. I even went outside at work today to see the pilots practicing for the show. My mother lives by the airport so we have even been explaining to my 3 year old daughter about the jets flying over head. She was a little scared because of the noise, but started to get excited when she saw the planes. When I heard that one of the jets crashed I immediately went into panic mode because of my mom's house being so close. I called her and confirmed my mom and daughter were ok. Then my attention turned to the pilot. When I saw where the crash happened I immediately knew that Captian Kuss was a hero. I knew in my heart he went down with the jet in order to save others. My mom and daughter were in the flight path. His actions saved many today, possibly even my family. I can't help but think about his family and how his wife is now a widow and his children are without their dad. I am heartbroken for them. I want to hug them and tell them how thankful I am for their dad and husband. I pray they can find even a small amount of comfort in the fact that he died a hero and thousands are mourning with them. I'm sorry, so sorry for their loss. If you don't feel the need to donate, don't. Also don't waste time leaving hurtful comments. There is a great sense of "I need to do something" within our community over here in Middle Tennessee. No matter the benefits they may receive, my $25 is the least I can do in honor of this man. Maybe, once living expenses are covered, a scholarship fund can be set up in his name at a local school or something of that nature. The opportunities are endless and he deserves to be honored for the sacrifice he made. To Paula Brooks questioning if this is really for Jeff Kuss. I live in the town he grew up in. This gofundme was set up by his family. It's legit and they are a well loved family from our small town of Durango, CO. It's the real deal and this family deserves the support of all if possible. Nothing but love from my fellow West Florida residents. We are so proud to be the hometown of the Blue Angels. Tgis is devastating news. It doesn't matter whether the family gets benefits. Its called compassion. Compassion can drive one to help those who are in need. No amount of money can make up for this families sacrifice, but it can help take extra burden off their shoulders in this heartbreaking time. If you dont agree, please keep your comments to yourself. These donations are given out of love and appreciation for his sacrifice. 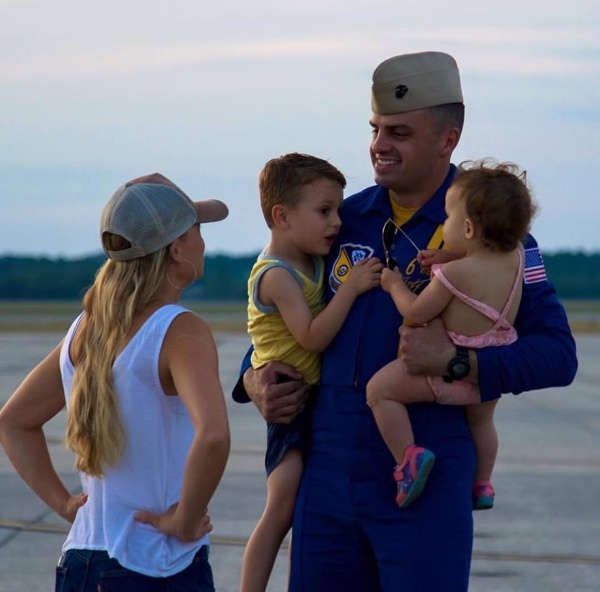 My heart goes out to the entire Blue Angel family. This man died a hero in our town! If you have nothing nice to say, please don't comment! Have respect for his family at least! It does not matter how much compensation his family will receive in benefits from the military, if you have half a heart and mind you would not even question this! Thank you Captain Kuss for your service, you are a true hero! Prayers to his family, friends, and comrades! God, please be with his wife and children and give them comfort and peace! From all of us here in the Smyrna/Murfreesboro area. We send our love and appreciation to this young man's family. Thanks for raising a hero. He saved so many people's live just by being selfless. In my eyes, he is the true definition of a hero . We can never say thank you enough. Rest in peace, Captain. Thanks for the great Service! Your smile will always be remembered. RIP BA 6! Thank You Blue Angels - "the sound of freedom" - God Bless America!